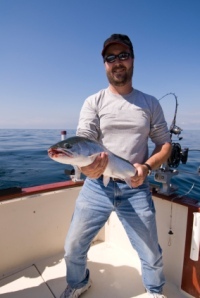 A Michigan fishing report needs to be reliable whether you are going out on the big lake or fishing one of the many inland lakes. Lake Michigan is huge and even with all the electronic gear you can still use a good information to get you headed to the right area. Reliable Michigan ice fishing information can save wasted time drilling useless holes. We want to provide you the best sources to help you catch the big ones ... and lots of them! Here are the top sources for the most current information. The same goes for fishing Michigan rivers, streams or inland lakes. Local bait shops will have good information and the tackle and bait you'll need to be succesful. The information will be current and accurate. Click here to get a list of discount hotels along the coast and save money. Check out our list of Lake Michigan Marinas to help find boat launches, safe harbor, or repairs if needed. Make sure your gear is in good shape! Reels need to be lubricated and line needs to be changed. Don't lose the "big one" because you haven't changed line since last year. Guys, this isn't the time to show off or be macho. Make sure you and your sweetie are being as safe as possible regardless the time of year. Wear life vests, and be mindful of the hooks, and other items that can make the best Michigan fishing report useless when you're on your way to a medical center.